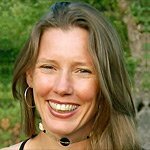 Catherine Cadden is an educator, storyteller and dancer with over 25 years of experience in bringing forth innovative programs in nonviolence, mindfulness, and conflict transformation to people of all ages on six continents. In 1997 she founded the TEMBA School, a visionary K-8 academic program which integrated nonviolent principles, mindfulness, art and peace studies. In 2006 Catherine co-founded Play in the Wild! Initiations into Nonviolence for youth, families and educators. Internationally recognized for her work, Catherine was a keynote speaker at the UNESCO Asia Pacific Education Conference in 2012. Her work with her indigenous roots, elders and teachers taught her to live interdependently with nature, a skill she enjoys sharing. She is a CNVC Certified Trainer and the author of Peaceable Revolution Through Education and coauthor of The Ongo Book: Everyday Nonviolence.